Several months and two orders later, I now have my Apple Watch. It arrived this past Friday, June 5th. 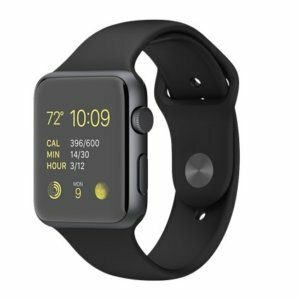 I ordered the Watch Sport 42mm Space Gray Aluminum with Black Sports Band (see picture). At first I was very impressed with the watch. It looked good and it matched my iPhone 6 Plus perfectly. The watch was a perfect companion right from the start. After a few hours of use I became aware that it was communicating with me. Right away I took notice that I was a couch potato. The watch looked out for my health by telling me to stand and move around. Later it kept tapping me on my wrist as I drove to my son’s lacrosse game. Each time my driving directions changed, the watch was there to notify me. Later on I discovered the watch was keeping track of my health and letting other applications use that information. Applications like LoseIt, 7M Workout (aka 7 Minute Workout), and more. Awesome! Then I looked for applications that I use regularly. Applications like Yelp, OpenTable, Meetup, Marriott, Fidelity, Starbucks and JetBlue. All great applications on the watch. Unfortunately this is all that is great about the Apple Watch so far. The rest of the experience has been a bizarre mix of odd bugs and flaws. Lets start with applications that should not be on the Apple Watch. Applications like MineCraft Skin Creator and Zillow. I guess the MineCraft Skin Creator got installed because my kids love MineCraft. Of course my daughter noticed it right away. Great for her, but for me, yet another icon I want off my watch screen. Then there is Zillow. I doubt you would want this on your watch unless you are on the market for buying a house. Zillow alerts you to houses near you that are for sale. It is kind of annoying when you are driving to a local restaurant in the next town over and you start getting houses popping up on your watch. Both of these applications were uninstalled within minutes of their annoyance being known. The one really cool feature is notifications while driving. I can completely focus on driving and get turn-by-turn directions without ever looking at my phone or taking my eyes away from driving. Just a quick glance to my wrist is all that is needed. This is easy because my hands are already on the steering wheel. Awesome! Until today that is. I got driving directions to a local business. When I arrived it sent me a notification that I had arrived. I conducted my business and went on my way. Then for the next hour I got repeated arrival notifications that I had arrived at my previous destination. The thing would not stop. I had to power down the watch and power it back on to get the notifications to stop. Unbelievable! The battery life on the first day was awful. I was right in the middle of standing and moving around based on a notification it sent me when it shutdown due to low battery. There was no alert, nothing. This begs the question whether this watch can be used 24 hours to monitor both your daily activity as well as your sleep patterns. I tried this on the second day after a full charge only to wake up in the morning to a watch whose battery was dead again. Bad, Bad, Bad! I hope Apple comes out with an update that fixes this. The Apple Watch is an okay, but not a great version 1.0 product. It definitely shows what is possible. As a developer, I think it is an amazing device to develop apps on and I look forward to working with it.